First time to be visiting UK. Have never before had reason to go, and considering my prejudices, have never chosen it as my vacation destination either. So now I finally made it there due to school course. While travelling, I always try to arrange dates with local guys to show me around and take the most of the time spent travelling. I was a bit disappointed to see that there were only couple guys in Warrington that I would have liked to meet. ..and I was rather pissed once I realized that I wasn’t staying at Warrington, but even a smaller village Lymm, ..damn. The first day, rainy of course, I spent at the hotel trying to figure out how to make it to Manchester for the evening. Never figured it out. Next day, thanks to some helpful advice, I did go on a journey to Manchester. Wandered around for few hours, had a look at a sauna ‘Basement’, but wasn’t excited over anything I found in Manchester. Well, before taking train back to Warrington, I did meet up with Todd for a 7 minute date at the train station, and went to visit him for little longer the next day. The cutest scenes I witnessed while in UK, were late night buses from Warrington to Lymm. Ride on a small bus was a social on it own. Both nights I explained to drivers that I need to go to Lymm hotel, but am not quite sure where would be most reasonable to get off. First night I had fallen asleep and woke up hearing bus driver explaining me where she was going to drop me off and how I could get to hotel from there – long sequence of lefts, rights and straights. I do admire ability of British to give exact direction to any point, telling all the turns, but my ‘topographically impaired’ brain is not quite compatible to accept all the directions, I can never remember where and how many turns I had to do. Hence, after listening to the directions for a minute I usually just asked again to point the direction which way to start walking. The second night getting back from Warrington to Lymm, bus was full of older people. As the bus arrived to Warrington bus station, I could see excitement among older ladies after checking who was the driver – ‘its Ian!’. Once on the bus, few ladies on the bus asked driver whether he had already eaten the chocolate they had given him. Throughout the half hour ride to Lymm, all older people getting on and off the bus stops knew each other by name. Before I dozed off again, I got a dose of most of the village gossip – but really, it was such a cute atmosphere to observe. And again I woke up to elevated excitement on the bus, which I figured out was again about where would be best to drop me off. Both of the nights I was dropped at a place in dark village and told the directions. While stop where I was dropped off first night, was somewhat familiar, then in the dark alley on the second night I had absolutely no idea where I was. I walked for 15 minutes in the pointed direction and was very pleased to actually find the hotel. At some point I had already thought that I had been dropped off somewhere too early. I had planned to write a comment on how nasty the British people are, as bus, and train and train station were full of garbage and rather sticky, but as I myself was forced to litter, I won’t blame British any more. Before catching train in Manchester, I first took a baguette and once eaten was trying to find a place to trash the napkins. As I could not locate one in few minutes, I stuck it all in my pockets hoping to find trash can on the way. Through the day I had been offered instant coffee which I could not drink and ended up pouring down the sink (sorry), I thought would be great to get a latte coffee of real beans at the trains station, at 9 pm. When steam valve of the coffee machine was opened, I smelt a disgusting stench. For a moment I had thought that hopefully it was not the steam used for my latte, and then figured, that it would not be possible to make a coffee with such stinking water. The first sip I took of the coffee, I horrifyingly realized that the stench was indeed in my latte! It was really disgusting. I was sorry for the £2.20 I had spent on it, yet I could not put it on my mouth and had to get rid of it. So again, on a guest trying to find a trash can. ..vain attempt, I believe I spent 15 minutes trying to find trash can in all possible locations, so finally before getting on a train, I shyly left the coffee cup on the stair step. I must have been in lousy mood as even though I had camera with me whole time, nothing excited me enough to be taking a photo. 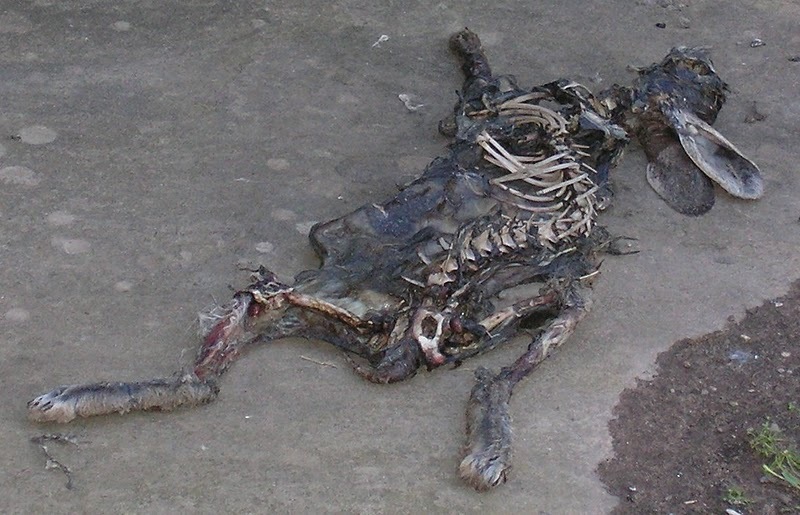 ▼Here’s a photo from my colleague Kati of a rabbit corpse she found on a grave plate at the Lymm cemetery. By the cemetery she also witnessed a small bird twitching on its back, and likely deceasing. So even though creepy, she had more interesting journey than I did.